The Doerle sets, designed by radio fan Walter C. Doerle of Oakland, CA, were a popular regenerative receiver scheme of the 1930s. In December 1931 the magazine Short Wave Craft carried Doerle’s first article about a simple two-tube regen receiver. The set, being inexpensive to build and get working, caught on like wildfire. Doerle wrote one or two other articles and quickly faded from the scene, little else is known personally about Doerle after his article. His design was not lost however, and was quickly picked up and popularized by the radio stores on New York City’s “Radio Row”. 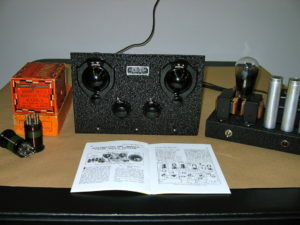 Bill Orr, in an article published in April 1979 Ham Radio Horizons magazine, states that “”Doerle clubs” sprang up around the country and “Doerle circuits” were sold as kits and as complete radios.” Orr had a great deal of good to say about the Doerle design, and you can click on the link at the right to read the entire article in PDF format. 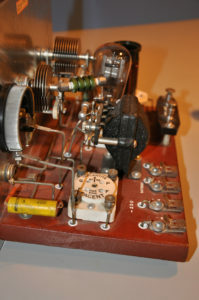 Most hams have not heard of the Doerle sets or Doerle circuits as the designs were carried largely by radio magazines catering to the general radio “bug” rather than to the hams. I’ve attempted to compile some basic Doerle information on this page, starting with the Radio Trading Company set in my possession, continuing on to other designs and background information. If you have any information to share, I would be delighted hearing from you! 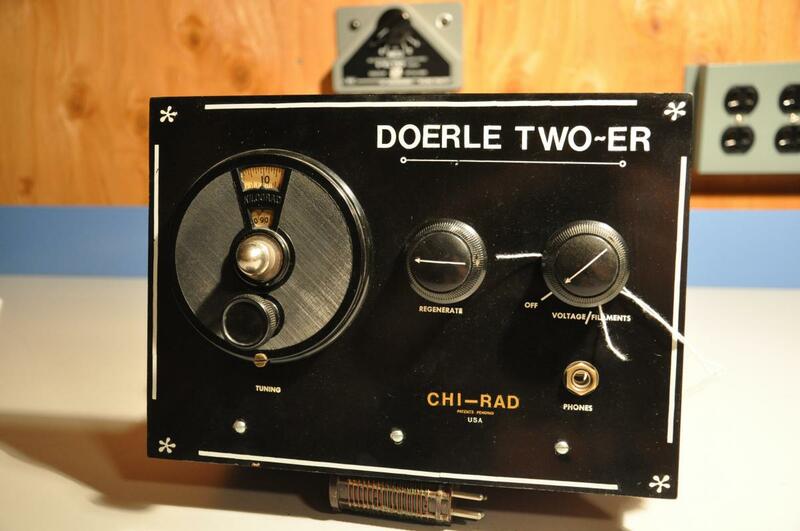 “Very scarce and historically significant find; an “Official” Radio Trading Company plug-in coil short-wave receiver, the Doerle Electrified Signal Gripper complete with plug-in coils, power supply and operating instructions. As mentioned in our recent National SW-4 receiver auction our knowledge and understanding of early radio equipment scarcity has drastically improved with the widespead popularity of eBay. Scarcity is often measured now in “appearances per year on eBay.” Or appearances every two years… or five years; or in the case here, this is the very first appearance of a 1934 Radio Trading Company Signal Gripper ever that we are aware of. Unless you could travel in time back to 1934 it is likely you will never see another. Most were long forgotten soon after 1934 as shortwave receivers progressed throughout radio’s Golden Era of the 1930’s and this one might be the only Signal Gripper remaining. If you have poured over Radio-Craft or Short-Wave Craft magazines from the 1930’s you have no doubt read of the excitement, adventure and romance that was stirred then by these receivers in the hearts of practically anyone interested in shortwave at the time. Radio Row’s Greenwich and Cortlandt Streets located in Manhattan’s southern tip were famous for busy little short-wave shops and bargain stores then and Hugo Gernsback’s Radio Trading Company was perhaps the best known of them all. I acquired this receiver at the Antique Wireless Association annual conference in Rochester, NY in 1998. The receiver was from the estate of John Kelly, N3GVF who lovingly restored it and promptly won a blue ribbon in the old equipment contest before becoming a silent key shortly afterwards. The radio restoring- collecting fraternity lost a true friend and accomplished craftsman/ historian but his legacy remains through these magnificent artifacts he has left behind. I tested the receiver and it is working. The power supply has been restored with modern electrolytics hidden underneath for safety and reliability but the originals have been left in place to preserve the appearance. The unused holes you see in the chassis are original and correct and were provided by the factory for different Doerle versions which shared the same chassis. 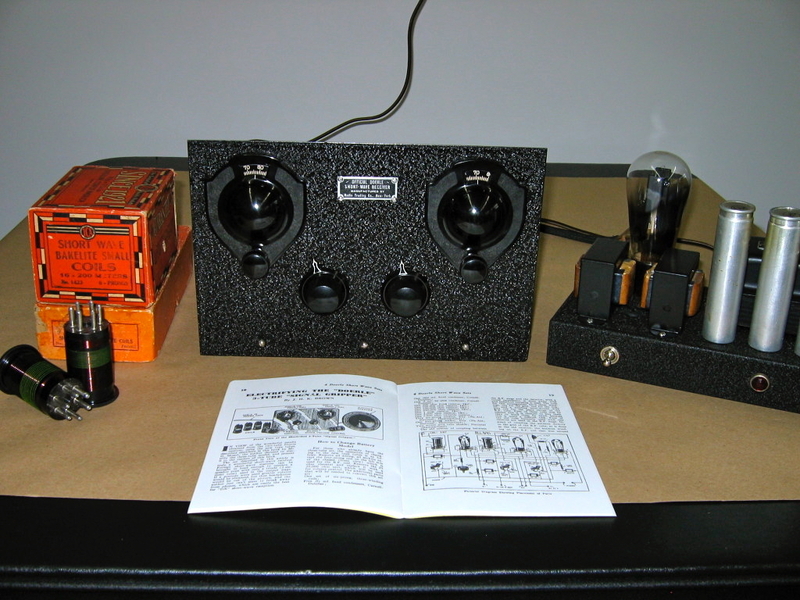 With the resurgence in interest and passion for owning and operating vintage equipment from the “Golden Era” of radio placing early equipment in demand an Official Radio Trading Company Signal Gripper in any condition is extremely difficult to find. I picked up this set at the radio meet near Boston. Suspect its a reproduction, but looking for info. I know that Doerle was the name given to a series of sets based on a design by gentlemen of that name from Oakland, CA. and that the”Two~ER” appears to refer to his design using a pair of type 30 tubes. Clearly this a regen receiver, but that’s about all I know. I did see this very same set at last years radio meet, its been kicking around for a while. There is another label near of the bottom on the back of the front panel, but can not be read, appears to have been partially removed, or perhaps the adhesive has come loose. The set uses, or currently has installed, a pair of Westinghouse 230 tubes, one of which has a test label dated 1931. The tube sockets are marked “Pacent” and seem to have some sort of adjustment mechanism? I am thinking that this was some sort of kit offered by Chicago Radio, but don’t know the vintage. Of course, it might be a very well built reproduction unit. I would be most interested in information about the origin of this set. a PDF file of the Doerle Book.